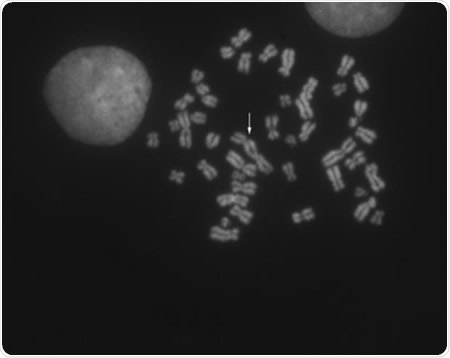 Ionizing radiation immediately causes characteristic changes to chromosomes. Chromosome biodosimetry studies can be used to test for exposure to radiation in occupational settings and other mass radiation emergencies and to monitor long-term effects such as cancer. 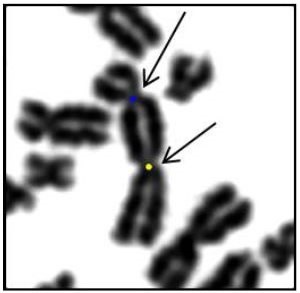 One major chromosomal alteration is chromosomes that contain 2 constrictions or centromeres, rather than just one. 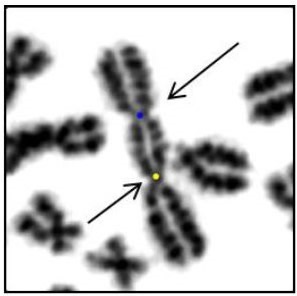 These chromosomes are referred to as dicentric chromosomes (DCs). Biodosimetry studies require specialist expertise and equipment, as well as being labor intensive and slow to perform. In order to respond to mass radiation casualties, with exposure to a wide and unknown range of doses, biodosimetry labs will require more techniques that can identify DCs accurately, within a few days. In order to interpret DCs automatically, data acquisition could be streamlined using a state-of-the-art wide-field microscope system developed by Huron Digital Pathology that can feed patent-pending image analysis software designed by Western researchers. This system from Huron will be designed to capture images ten to 30 times more rapidly than currently existing systems and Western will validate performance using samples developed in our laboratory. The aim of this project is to significantly increase the speed at which radiation dose is estimated, preferably to within 48 hours of exposure or patient ascertainment, whichever happens first. Experimental validation and proof-of-principle engineering of a wide-field epifluorescence microscope with high power magnification capabilities (≥63X objective, 1.4NA) was performed. The wide-field TISSUEscope™ CF, (previously called the TissueScope 4000 system) system currently offered by Huron Digital Pathology and based on MACROscope technology does not have a high enough resolution to detect DCs, which is essential in automated biodosimetry for measuring exposure to radiation. The present system will be modified by Huron to meet the need for more rapid data generation. The benefits of the patent pending analysis software being developed by Western researchers will be maximized by a higher data throughput. 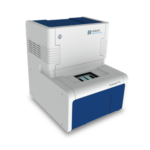 The TISSUEscope CF is a third-generation fluorescence and brightfield scanner intended for use in high-sensitivity fluorescence imaging of up to 4 fluorophores simultaneously. The instrument uses a laser scan lens with a 20-fold equivalent resolution and at least 10-fold greater viewing area than that of equivalent microscope objectives. This provides a massive advantage in whole-slide imaging, with much less chance of stitching artifacts, even when very large specimens are being imaged. It is possible to image both strong and weak fluorophores in the same scan by using adjustable gain for every channel with a large dynamic range (12 bit) fluorescence detection. 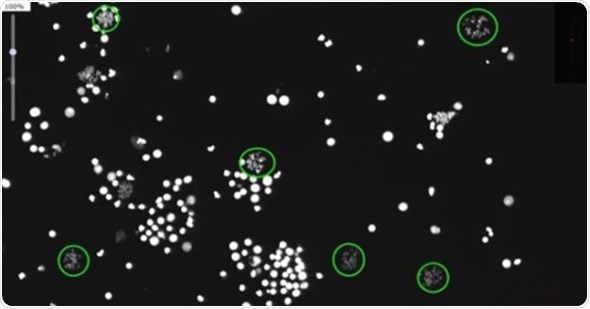 A DAPI fluorescence image of a biodosimetry slide imaged using the TISSUEscope™ at 10X equivalent resolution is shown in Figure 2 (top). The scan area is 22 x 46.2mm. A 100% zoom area of the 10X image is shown in Figure 2 (bottom), where a number of ROIs (regions of interest) are shown in green circles. 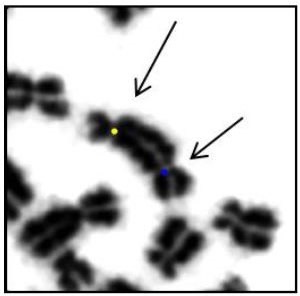 Once identified in the 10X (bottom) image, the ROIs are imaged at 63X with a 1.4NA oil objective so that the chromosomes can be clearly identified and any DCs automatically interpreted using the image analysis software developed by Western researchers. In the event of mass exposure emergencies, there will be an acute need for faster sample preparation, microscope hardware acceleration and the automated interpretation of the chromosome images obtained if it is going to be possible to cope with the overwhelming demand for biodosimetry testing. Working together with Western University, Huron’s aim is to design a high speed hybrid imaging system that uses the MACROscope scanning technology and patented imaging technology to automatically capture and interpret chromosome images. 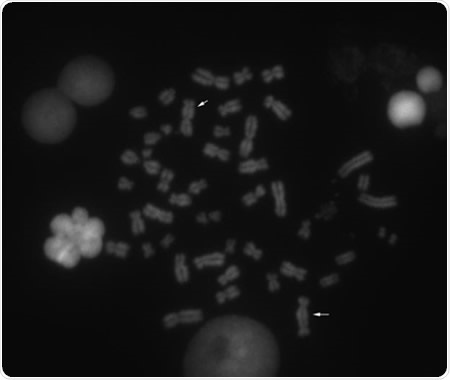 Western is focused on accelerating sample preparation and microscope hardware and integrating these elements with automated software to interpret dicentric chromosome images. This is currently being supported by pilot funding from NIH. FedDev ARC partially funded the partnership between Western and Huron. Based in Waterloo, Ontario, Canada, Huron Digital Pathology has a 20 year history designing sophisticated imaging instrumentation. Our end-to-end digital whole slide imaging solutions for digital pathology incorporate our award-winning TissueScope™ digital slide scanners; TissueView™ image viewing, sharing and management platform; and our workflow-enhancing accessories, which include our innovative TissueSnap™ preview scanning station.